​Buy the Wild Place annual membership and join us for a year of unlimited fun - visit us as many times as you like from as little as £30! Go on a variety of outdoor adventures at Bristol’s fun family attraction, Wild Place Project. Visit some of the exciting animals – from Madagascar, east Africa and the Congo and find out how we’re helping to conserve them in the wild. Go barefoot and enjoy our Barefoot Trail experiencing the different textures underfoot. We have a scramble net and fireman’s pole which the kids will go mad for in our Fun Fort play area. Why not enjoy visiting our award winning RHS Chelsea Flower Show garden, or the Sanctuary Garden and let the children run off steam in the great outdoors at Wild Place Project. A Wild Place Project annual pass grants you unlimited entry* into Wild Place Project for a whole year, giving you the freedom to make frequent visits whenever you want. A Wild Place Project annual pass really is great value and can pay for itself after just four visits compared with normal entry prices. 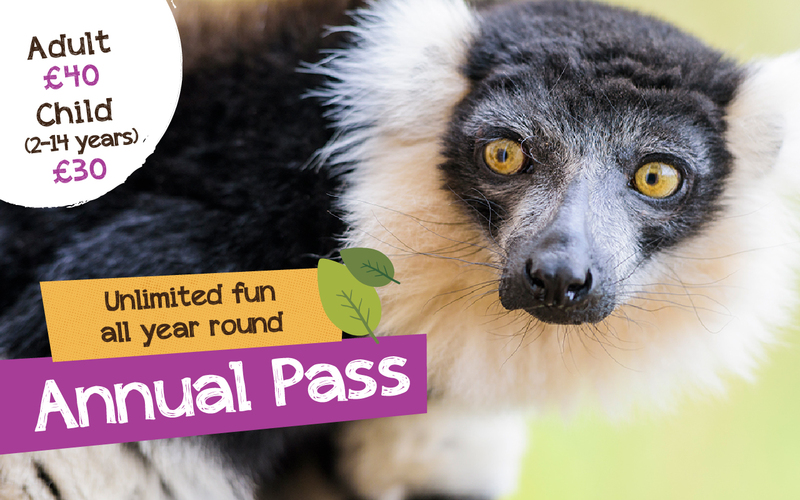 As an annual pass holder, you will be directly contributing to our valuable conservation work, helping us to care for the animals at Wild Place Project as well as protecting endangered species across the globe. If you buy a Wild Place Project annual pass on the day you visit us, we’ll refund the cost of your entrance (we just need your receipt). This is only available when purchasing an annual pass in person, not online. Recommend a friend as an Annual Pass holder and you’ll receive a £7 voucher that can be used in the Courtyard Cafe – so you can both enjoy a day out at Wild Place Project together and catch-up over coffee and cake! Annual Pass holders, please fill in your name, membership number, email address and contact number on this form. Pass the form onto your friend to hand in when they take out an Annual Pass. We’ll then send you your £7 voucher. Voucher must be used in one transaction, no change given. Click here to renew your Annual Pass today to continue the fun! Join us for another year of unlimited fun* and visit us as many times as you like. We hope you’ve enjoyed all the perks that an annual pass brings. A Wild Place Project annual pass really is great value and can pay for itself after just four visits! Plus, the Wild Place Project is continually developing so there is always something new to see and do! Renew now to make sure you don’t miss out on another year of unlimited fun at the Wild Place Project. Become a dual member and enjoy unlimited visits** to Wild Place Project and Bristol Zoo Gardens! Click here to find out more.